Polar aligning an equatorial mount for astrophotography purposes is not as easy as just pointing the mount to Polaris and commencing an imaging session. 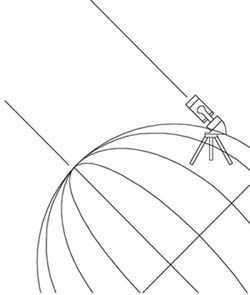 For astrophotography purposes good polar alignment is absolutely necessary! The effects of bad polar alignment are field rotation and images that seem to drift right out of the field of view of your cameras. Both are very frustrating and very easy to experience if one hasn’t spent the time performing an adequate job of aligning the mount. There are different ways of going about the alignment process, but my favorite is the drift alignment method. I have found that after one gets the hang of it, this method is extremely accurate and one can actually see how well the mount is aligned in real time. Any and all errors are clearly visible right on your computer screen. I perform drift alignment with my CCD camera in prime focus, and use K3CCDTools3 and its reticule feature for monitoring the drift of the mount. Lawrie, drift alignment really isn’t anywhere near as hard as it sounds (although it does sound pretty daunting) – I avoided learning how to do it for way too long myself for that very reason. Understanding what you’re trying to do is key. Hopefully, I can explain it in a simple to understand way. In fact, I may over simplify for you just because I don’t have any idea what your experience level may be. Because of this, please don’t think I’m talking down to you if my explanations seem too simplistic. I just want to make sure that I present this in an easy to understand way. On the other hand, please feel free to point out any portion of the following that you don’t pick up on, and I will do my very best to clarify it for you. That said, let’s get started. I’m not sure what kind of mount that you have, but I’m going to step out and make a guess that you do not have a fork mount on an equatorial wedge, but rather you have a GEM (like a CG5, SkyViewPro, LXD-55 or 75, or a similar mount). If this isn’t the case then let me know, although it really does not change things too much. It’s important to note that while it’s not exactly essential to do a rough polar alignment on your mount, it will save you a *lot* of time in the process, because the closer you are to being right on, the less you have to move your mount around to get it right on. Just guessing about where North is and how high Polaris is may put you farther out of alignment than the mechanics of your mount can compensate for, which would force you to physically move the mount in order to get it “in the zone”. This would be very painful to discover 15 minutes or even longer into the process, so I would *strongly* recommend that you at least level your mount and sight Polaris through the polar scope (or the hole where one would go) before getting started. It will save you a *lot* of time from here on out! If you can’t see Polaris, then point the mount due North, and set your latitude as closely as you can. This is far from being an accurate way to do it, but it’s better than just guessing. Also, try to make sure at this point that your East – West (right-left) adjustment bolts (on either side of the mount as opposed to the front and back of the mount, which adjust up and down) are set so that there’s plenty of travel in both directions – it would be very painful to find out that you couldn’t move the mount more in a direction because you started out too far to one side or the other! I say this because the farther you are out of perfect alignment, the more travel you may need to get there, so it really pays to keep this in mind. While we’re talking about how you’re setting up, let’s also touch on where you’re setting up – you need to have a clear view straight over your head and to the south (behind the mount), and you also need to have a view either to the East or West that is as low to the horizon as you can get it for the drift alignment to work. Now, set up your camera in the telescope and get it focused. Start up whatever program you have (you mentioned K3CCDtools so I will proceed from the assumption that you have it), and bring up your preview window. Find a star. Any star will do to get the camera focused, but at this point you may as well choose the first star you will need for your drift alignment – this is a time saver. Here’s an easy way to figure out where in the sky this star is. First, move your mount so that the counterweights are parallel to the ground, and your scope is facing straight up. This will put your scope on the meridian (an imaginary line running from north to south straight over your head). Now, looking at the body of your mount, move the scope in DEC toward the south (the rear of the mount) so that your scope and the mount look something like a “T” laying on its side (if you look at the scope and mount from the side). This points your scope roughly at the celestial equator. Take a look at this area of the sky and pick a star that is somewhere in this general vicinity – it does not have to be exactly there, just in the neighborhood. The important parts to consider is that you don’t stray too far from here, and that the star is easily visible on your preview screen. Use this star to focus your camera – it doesn’t necessarily have to be a critical focus, but the sharper it is the better. Now we need to line up the camera and figure out which direction the image is oriented. Bring up the recticle display in K3. Now slew the telescope so that the star moves in a left-right (or right-left) direction, and note how well the star tracks the horizontal line of the recticle. You need to rotate the camera in your focuser so that the star follows the horizontal line of the recticle as closely as you can possibly get it. Be prepared to spend some time learning how to do this step, but once you figure it out, it’ll take less and less time to accomplish. 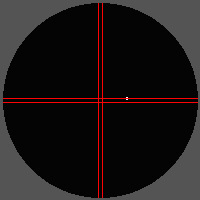 Once the star tracks exactly with the horizontal line of the recticle then your camera’s orientation is set. Now you need to figure out which way North, South, East and West are in your view. This is easy to do. To find North-South, just lightly push on the South side of your scope (on the end that the light is coming in) towards the North while watching the display. Push just enough to be able to see the star move in your display. Your star will appear to move to the South. Now you know the North-South axis. You can use a similar routine for East-West – lightly pushing on the West side of your scope towards the East makes the star appear to move West. Whew! All that to get to here! Now we’re ready to actually look at the East-West drift of the mount. As counter-intuitive as this sounds, we look for this East-West misalignment by watching for a North-South drift of the star in our display. Slew the scope so that the star you’ve just used to focus and orient your camera with is placed exactly on the line of the recticle that runs East-West. Try to place it as exactly on the line as you can. We want to bisect the star with this line (cut the star in half). If the star drifts South, the polar axis is pointing too far East. If the star drifts North, the polar axis is pointing too far West. Depending on how far out of perfect alignment you are, the star may start to drift immediately. You can make adjustments as soon as you can positively detect the direction it’s drifting in, using the above rules. At first, you will probably want to make a fairly large correction. Watch that you do not lose your drifting star off the edge of the screen while making your adjustments – if it looks like that is going to happen then center the star and then continue to move the mount if you need to. As you get closer to nailing the alignment, make smaller and smaller moves. I find that sometimes it’s advisable to adjust past where you think the perfect point is so that you get a sense of what you are accomplishing by moving the scope. The bottom line here is that you are aiming for having the star stay perfectly bisected by the East-West line of your recticle for a longer period of time than you would want to expose for without guiding – a good time frame is five minutes with no drift – the longer it can stay right on the line the better your alignment is. I’ve had the star stay perfectly bisected for over a half hour (I lose track of time chatting with folks while it drifts), which is a very good alignment. Now that you have drifted out the East West misalignment, you need to do the same for the North-South axis. Leaving your DEC axis exactly where it is, unlock your RA axis and move it either to the East or West, whichever direction gets you closest to the horizon. Find a star in the general vicinity, just like you did earlier. Your camera should still be focused and correctly oriented, so all you need to do at this point is figure out where North-South and East-West are again, using the same trick you used earlier. Once that’s settled, you’re ready to go. If the star drifts South, the polar axis is pointing too low. If the star drifts North, the polar axis is pointing too high. If the star drifts South, the polar axis is pointing too high. If the star drifts North, the polar axis is pointing too low. As before, we’re looking to keep the star bisected on the East-West line for as long as we can stand to watch it – at least five minutes is a good rule of thumb, longer is always better. Once you have this down, you might want to go back to check the East-West just in case you accidentally messed something up along the line – that’s your call. No question about it – this procedure takes time – time to learn (repetition and familiarity make it faster), and time to perform (repetition and familiarity make it faster). It taxes your patience, but it is definitely worth the trouble! I had no clue on how to properly align my equatorial mount until I read the above explanation by Charlie. I now keep a print out of the directions on me every time I go out to image. The picture to the right is a perfect example of how an image will look like if your equatorial mount is poorly aligned. 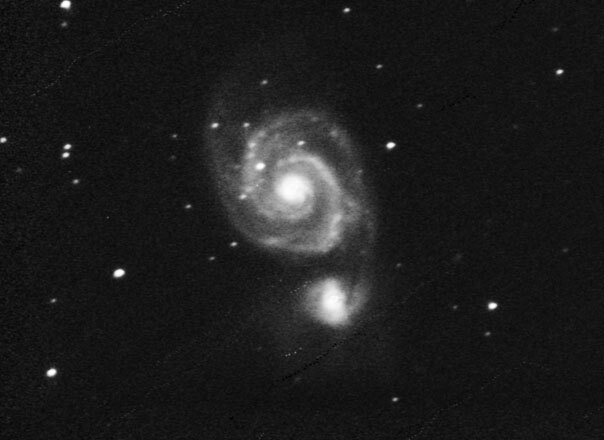 The night I took this image I was in a hurry to align the mount so I could get going imaging M51. Can you blame me? You will probably have to click on the picture to enlarge it, but in it you will see streaks that go from top right to bottom left as well as stars that look elongated. These streaks are actually hot pixels which decided to make there presence felt between my regular dark frame acquisition sessions which I do between light imaging session. Actually, this image was one of the reasons why I decided to Peltier cool my DSI Pro! At any rate, the downward direction of the streaks shows that my mount was poorly aligned. I hope that the information here will help some out there as much as it has helped me. 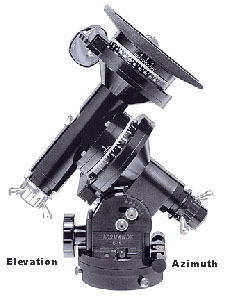 Drift alignment of your equatorial mount is an important concept to master as an astrophotographer. Good luck and clear skies.